Inertial Measurement Unit – essential in self-driving cars! They are here or on the way – the self-driving car! It is one of revolutions which could change lives in the 21st century. Here Mike Horton, Chief Technical Officer at ACEINNA discusses seven reasons your life depends on an accurate IMU (Inertial Measurement Unit) in these self-driving cars. The following of Seven Top Reasons is just a start, additional reasons and benefits of an accurate IMU are welcomed as responses to this post either as comments or direct to the author himself at ACCEINNA. Aceinna along with other companies in the industry are working hard to remove the cost barrier. Electric vehicle pioneer favours wireless test rigs. A company that has been at the forefront of electric vehicle design and development for over 20 years has supplied a test rig based on a wireless torque sensor to a world renowned British University automotive research facility. Tirius has been built on pioneering work on an all-electric single seat racing car and a series of record breaking vehicles. It continues to bring the latest technology to clients in the form of product design and development and the provision of its range of electric drive systems. The design of the test rig is in fact quite simple, thanks to the torque sensor, a TorqSense, as made by Sensor Technology. “We are pleased to promote TorqSense and the guys at Sensor Technology,” says Tim. “We have been using their kit for many years and in many different roles. The bottom line is that they are easy to use, accurate and great value – partly because they can be re-used once their original project has been completed. Its data is output to a very user-friendly computer screen which uses graphics to aid easy interpretations. In fact the display on the computer is similar to a car’s dashboard, so most people understand it intuitively. Further, the data is automatically logged for further analysis. Tim again: “With our type of research work there are some potential errors that we have to look out for, including time-based zero-drift, bending moments on the shaft, bearing losses, temperature fluctuations etc. These are easily accounted for with TorqSense-based test rigs. Normally you have to account for the drag caused by the slip rings, but the wireless TorqSense does not use them, so that is one less calculation – and one less fiddly fixing task. World’s first LiFi enabled light bar! Mainstream adoption of LiFi will be available within LED light bars which will replace the most widely utilized light source in the world – fluorescent tubes. The introduction of the first LED “light bar” is forecasted to replace the most conventional form of lighting within commercial and industrial facilities: fluorescent tubes; with an estimated 3-4 billion installed throughout the world. pureLiFi and Linmore LED will demonstrate this new technology at LuxLive from the 15-16th of November 2017 (London GB) as part of their LiFi experience zone. Wireless connectivity is evolving. The spectrum now has to accommodate more mobile users and is forecasted to increase to 20 Billion devices (forming the IoT) by the year 2020 which will result in what is known as the Spectrum Crunch. However, LiFi can open up 1000 times more spectrum for wireless communications to combat this phenomenon. LiFi is a transformative technology changing the way we connect to the Internet by using the same light we use to illuminate our offices, home and streets. Integration of LiFi within LED strip lights will drive mass adoption, enabling LiFi to easily move into full-scale implementation within offices, schools, warehouses and anywhere illumination is required. LiFi utilizes LED lights that illuminate both our workspace and homes to transmit high-speed, bi-directional, secure and fully networked wireless internet. Lighting manufacturers are important players in the adoption of LiFi technology. Linmore LED has built its reputation in the retrofit market, and they ensure their portfolio of LED products perform in the top 1% for energy efficiency in the industry. Retrofit fixtures are in great demand as many facilities seek to drive down energy costs by as much as 70-80% which can be achieved by converting to LED technology. This trend is also driven by the increased operating life that LEDs provide and the concerns of toxic mercury utilized within fluorescent lamps that complicates disposal. This provides a scenario where building owners and facility managers can adopt LiFi technology while dramatically decreasing lighting-related energy costs at the same time. LiFi offers lighting innovators the opportunity to enter new markets and drive completely new sources of revenue by providing wireless communications systems. LiFi is a game changer not only for the communications industry but also for the lighting industry, and with LiFi, Linmore certainly has a brighter future. Sensors in space – will they last 100,000 years? When the European Space Agency’s (ESA) Rosetta space probe arrived at Comet 67P/Churyumov-Gerasimenko it had been travelling for ten years and had travelled 4 billion miles on just one tank of fuel. 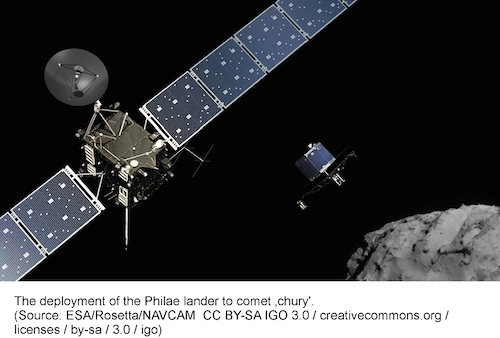 If the fuel had run out before the probe reached the comet, the navigational thrusters would not have been able to make the numerous course corrections needed to rendezvous with the comet and then establish a stable orbit from which to launch the Philae landing module. Throughout the long journey, Kistler pressure sensors monitored the fuel consumption continuously for the whole ten years to ensure that Rosetta arrived at its destination with enough fuel to make the final corrections to put the probe into orbit. The Rosetta mission was one of the most ambitious projects executed by the ESA and two Kistler piezoresistive sensors played a small but valuable part in the success of the project by providing precision fuel monitoring from March 2004 onwards. The key selection criteria for these sensors included their proven longevity and total reliability despite high levels of vibration at lift-off and years of zero gravity conditions. Rosetta’s cargo includes what is known as the Rosetta Disk – a nickel alloy disk with information etched onto it in image form. The disk contains about 13,000 pages of text in 1200 different languages, and it should still be readable after 10,000 years: durable though they are, even Kistler’s sensors are unlikely to be functioning after such a lengthy period! Accelerating development of smart, power-efficient IoT applications! B&B Electronics has introduced its Wzzard™ Intelligent Sensing Platform. Wzzard is an easy to use, complete wireless sensor connectivity platform for the rapid deployment of scalable, intelligent, reliable Internet of Things (IoT) networking in remote and demanding environments. Wzzard was designed to help integrators, VARs and service providers efficiently develop and deploy secure, smart, self-powered, and scalable IoT applications. Unlike a traditional SCADA application where sensors and edge devices are simply passive conduits for raw data, edge decision making delivers a more effective network. Using iterative control limits and gateway data aggregation to support applications closer to the network edge, the Wzzard Intelligent Sensing Platform brings this intelligence to the network starting at the sensor, creating a more responsive, reliable and efficient network. 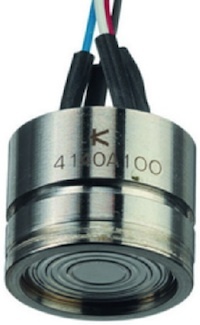 First, Wzzard Intelligent Edge Nodes will connect, via conduit fitting cable gland or M12 connector, to any industry-standard sensor. General-purpose analog inputs, digital input/output and thermocouple interfaces are included. B&B has already integrated internal temperature and accelerometer sensor options, and can integrate other application specific sensors upon request. The Intelligent Edge Nodes are easily configurable, using Android or IoS smartphones or tablets and the Wzzard app over Bluetooth LE 4.0. They can be configured to communicate only data outside specified thresholds, reducing the cost on cellular networks, as well as to associate other useful information (geo-location, device name, and up-time) with the collected sensor data for upstream analytics applications. Control time synchronization is used to maximize battery life, exceeding 5 years for many applications. Nodes are IP67 rated for outdoor use and include both magnetized and screw mount options. Wzzard also uses the lightweight, publish/subscribe messaging transport MQTT protocol for sensor communications. MQTT is an extremely simple messaging protocol created for M2M and IoT applications over wireless networks. Its efficient distribution of information to single or multiple receivers, low power usage and minimized data packets make it ideal for mobile or remote locations. Unlike older SCADA protocols such as Modbus, MQTT places few restrictions on the volume or type of data that can be communicated. This facilitates a meta-data approach where multiple IoT applications can act upon the information simultaneously without having to know its origin. Finally, B&B’s programmable, industrial-grade Spectre router serves as Wzzard’s Intelligent Gateway. Spectre can connect equipment and other devices to the Internet or Intranet over either wired Ethernet or wireless cellular connections. Spectre is built for plug-and-play simplicity with extensive remote management, deployment and customization options. 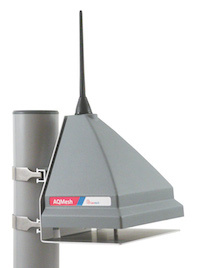 It is a robust, flexible gateway designed for easy deployment in demanding environments and the cellular version creates secure connections in locations where cable connections are impractical. Processed information from the sensor nodes is published through the Spectre Gateway up to the customer’s IoT application using MQTT transport protocol. Keeping all Welsh air good! Situated in the south west of Wales, in a largely rural area bordering the Brecon Beacons, Carmarthenshire’s air quality is predominantly good. However, there are areas of concern where major roads pass through some of the County’s larger towns, including Llanelli, Carmarthen and Llandeilo, where air quality is dominated by the effects of road traffic. The County Council is therefore testing new monitoring technologies so that it will be better able to track the effects of improvement measures. 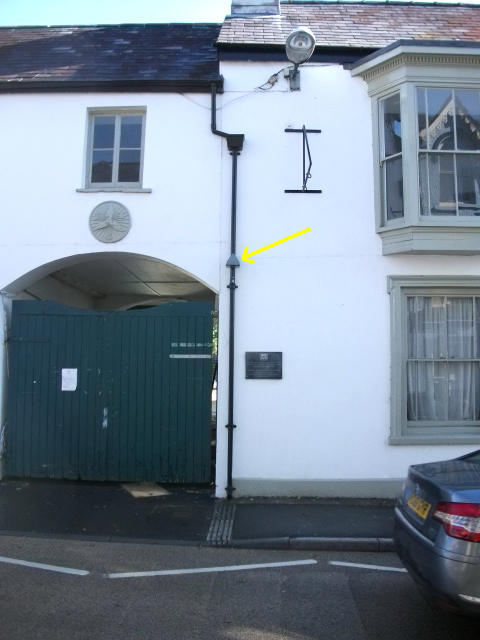 The unobtrusive sensor in situ! The AQMesh in Carmarthenshire is being operated by Oliver Matthews, one of the Council’s Environmental Health Practitioners with specific responsibility for air quality. He says: “In the past we have not continuously monitored this range of parameters because doing so would have involved the installation of a large, expensive air quality monitoring station that would have probably required planning permission.